The devastating tornado that hit Missouri last Sunday evening left more than 115 people dead and hundreds injured and trapped in buildings. The worst hit is Joplin, southwest of Missouri, with 75% of the town virtually gone. With a path of at least a mile wide, the massive tornado flattened buildings including a hospital, school building, fire station and shopping mall. A helicopter was also destroyed and seen lying on its side in the parking lot. 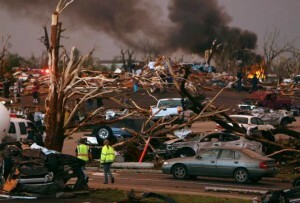 Joplin was a direct hit with debris and cars tossed up to 70 miles away while some structures were engulfed in flames. Both residential and commercial areas were affected by the devastating tornado. Bodies were being removed from the debris, out of cars and collapsed buildings. Witnesses described the disaster as “complete devastation” and “beyond belief “. It was reported to be the deadliest of the 46 tornadoes that hit 7 states on that day. The State Governor declared a state of emergency and ordered National Guard troops to assist on the immediate search and rescue operations. The United States has been hit by series of tornadoes sweeping across several states with more than 300 deaths. Violent storms and tornadoes hit southern U.S. and leaving more than 270 people dead, thousand injured and hundreds of thousands without power. The epic storms destroyed neighbourhoods and towns with majority of deaths in Alabama. Other states affected are Georgia, Virginia and Arkansas. It was an amazing scene to those who survived and called the storms as “silent monster” due to its magnitude and severity. 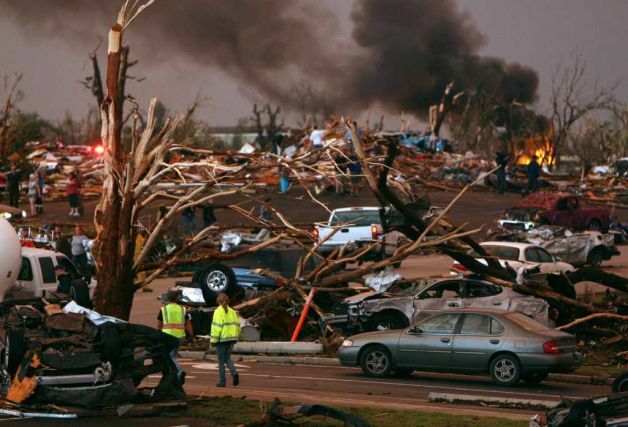 Authorities considered the event as the most devastating tornado outbreak in the country’s history. The destruction covered an estimated 5 to 7 miles long and a mile wide. Residents in the area compared the surge of the storms to “an atomic bomb that went off in a straight line”. With more reported injuries and devastation in the affected areas, the federal government is doing their best to help in the recovery including search and rescue support. Six states in the southeast have now been affected by the powerful storms. More than 40 people are now believed to have been killed in the last three days according to the authorities. One meteorologists described the situation in North Carolina as an “epic event” – a total of 90 tornadoes occurred just for this period, whereas the state usually gets 19 tornadoes a year. The super cell storms left trail of damages to properties and power lines from parts of Midwest and South and now heading to East.